Does this headline not sound like a perfect slogan for the SterlingPro French Press? Of course, only if it lives up to its promise – to provide you with a different, a better coffee! For this purpose, I reviewed the SterlingPro Coffee Press to verify whether it meets exactly your demands. If you don’t know yet what coffee to expect with this French Press, rest assured that your question will be answered. And in case you are wondering what makes this French Press unique, just keep reading. Let’s be honest about the SterlingPro Coffee & Espresso Maker, as it is described at Amazon. You cannot make real espresso with it! To put it another way, the SterlingPro French Press and every other Coffee Press can produce a strong coffee but no espresso! However, it may be the richest and smoothest cup of Java you have ever brewed at home. And you are in control: the coarseness of the grinds, the steeping time, the water temperature – everything can influence the final coffee flavor! For some, it may be too much work and responsibilities. Maybe for you, it is a challenge to get a better and better result with the next brew. 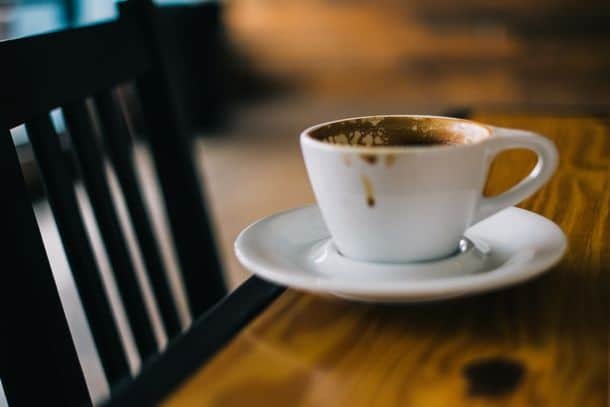 And if you do it right, you can enjoy a heavy bodied coffee with intense flavour, that may remind you somehow of espresso – let me call it “Frenchpresso” – just kidding, but I like the word. Now that we have clarified the espresso myth let’s move on and have a look at the SterlingPro French Press itself. If you’ve had a French Press before the next paragraph is probably not new to you. In case this will be your first contact with a Coffee Press, you have the right to know that there is one major drawback of French Presses. This disadvantage actually makes people think twice whether to purchase a French Press or not – even though the brewed coffee is in a class by itself! So why do people hesitate to purchase a coffee maker that promises such an exceptional coffee experience? I tell you: It’s the unpleasant feeling of having ground coffee in your mouth. To explain how those sediments end in your coffee let me start with the actual brewing process. According to SterlingPro, this French Press removes ALL grounds from the coffee. After you added the ground coffee, you pour hot water in the beaker and wait about 4 minutes. Some of those coffee ground particles find a way to escape when you push the plunger down with the next step. As a result, you have some nasty coffee grains where they should not be – in your cup. SterlingPro knew this and invented a simple but at the same time ingenious Double Screen System. In a few words, the larger screen touches the glass tightly and catches most of the coffee grounds. With the second screen, the SterlingPro French Press filters the tiny grounds which have passed through the primary screen. 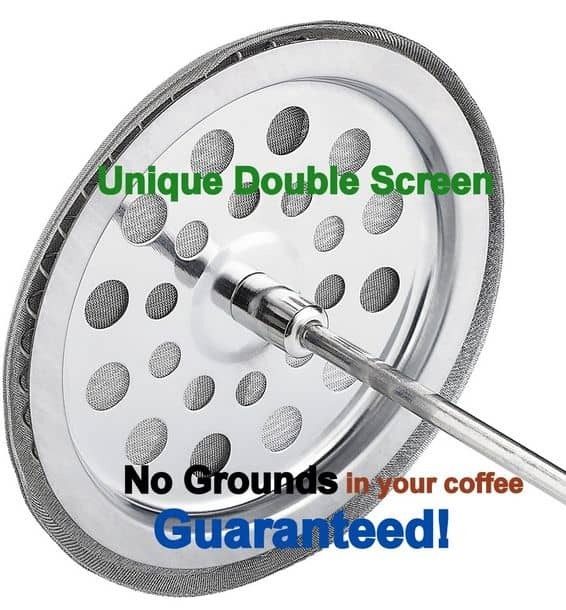 SterlingPro claims, their Double Screen System is the only one in the coffee press market. They are so convinced of their concept that they give you a 100% guarantee that your coffee is free of grounds! Although I am not sure about your chances to win a lawsuit in case you find a grain in your mug. 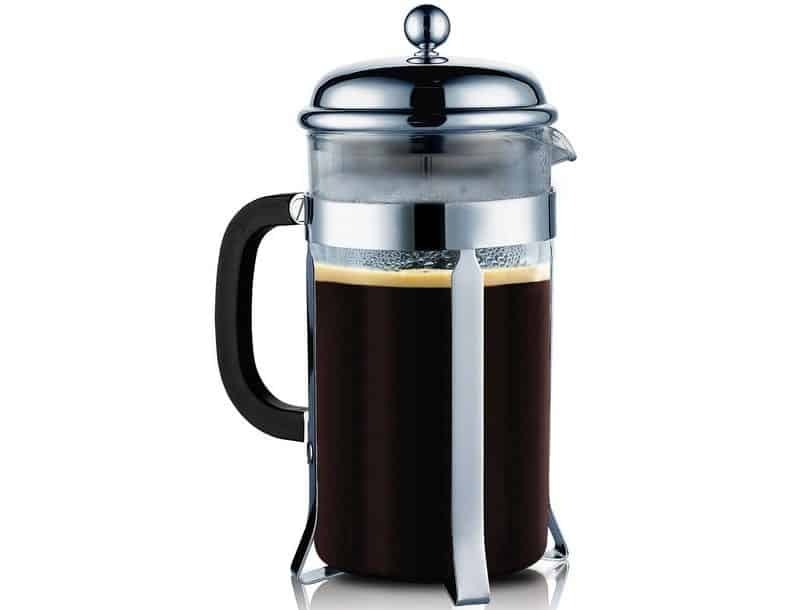 The SterlingPro French Press can brew up to 34 ounces of coffee. I purposely used ounces and not cups because Coffee Presses usually consider a cup 4 ounces. If you can’t picture 4 ounces in a cup at this moment, you should really try it – or you simply trust me when I say that it just looks wrong. However, if you prefer a smaller kind of French Press look further below. 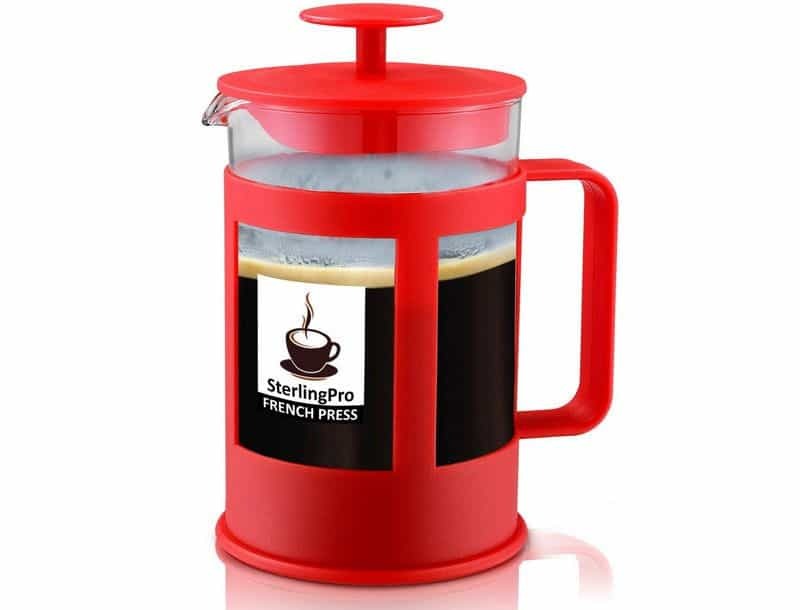 SterlingPro offers a 28 oz Coffee Press, but with a different design. The SterlingPro Coffee Maker appears in a sleek and shining housing. With its chic design, it does not deserve a place in the cabinets. If you leave it on the counter, your friends and family would for sure admire this beautiful coffee press. You do not have to worry that the hot water can break the glass because it’s heat-resistant. The glass of the French Press is heat resistant. So don't worry that it breaks when you pour hot water. But never ever put the SterlingPro French Press in the Microwave because the stand is made of metal. Furthermore do not put the glass beaker on the stove to heat the water or it likely will break! As you can see in the picture, the 6 Cup or 28 oz. SterlingPro French Press comes in a strawberry red color. However, you may rest assured that all quality features like Double Screen System or heat-resistant glass are the same. So if you simply like the red design or want to save a few dollars, you can choose the smaller version without any concerns. To sum up my SterlingPro French Press review, both the 8 Cup or 6 Cup version is a fantastic way to make superb coffee at home. It’s Double Screen System eliminates the biggest disadvantage of French Presses – the sediments in your cup. And if you are passionate about the do-it-yourself challenge to find your perfect coffee flavor profile, I can highly recommend you this beautiful french press. Now it’s time for you to decide! Get your SterlingPro French Press now!